Join The Best of Teacher Entrepreneurs Marketing Cooperative at http://www.thebestofteacherentrepreneursmarketingcooperative.com/2014/01/the-best-of-teacher-entrepreneurs.html and get THOUSANDS OF PAGE VIEWS for your TpT products! 1. Print the first 5 pages and use the pages as a “cut and paste” activity. The students will use glue to paste the correct answers where necessary. 2. Print all the pages on photo paper and laminate them. Cut out the pages containing the colors, numbers and pictures. 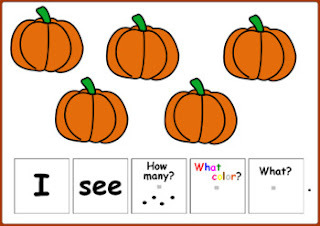 There is 1 page that serve as a board for the types of answers (“what?”, “how many?”, “what color?”). Use Velcro on the back side of each card and in the middle of each blank square on the boards as well as on each square containing the questions. Thus the activity can be reused as many times as needed. -using cards with only words, as shown on the title page. This is a great matching activity for K and 1st gr and for students with autism. LEAVE FEEDBACK AND RECEIVE TPT CREDIT! Dear buyer, I wanted to remind you about the fact that you can build up TPT credit by leaving feedback on my products. You can submit feedback at the time of purchase or go to My Purchases for a list of what you have bought in the past. Next to each title you`ll find a Leave Feedback button. If you click and leave a rating and comment you`ll receive the credit. Then go to TPT Credits to learn how to redeem your credits on future purchases! BECOME A FOLLOWER OF MY STORE! Being a follower of my store you`ll learn about my new products, sales, and discounts! Become my follower by clicking on the green star on any of my pages and receive email updates in your TPT inbox. and get THOUSANDS OF PAGE VIEWS for your TpT products! Go to http://www.pinterest.com/TheBestofTPT/ for even more free products! Visit Victoria Leon's profile on Pinterest. Get THOUSANDS of PAGE VIEWS for your TpT products! Purchase your one year membership at http://www.thebestofteacherentrepreneursmarketingcooperative.com/2014/01/the-best-of-teacher-entrepreneurs.html. Great Way to Spiral Math Skills Each Day! #worldteacherday Sale on TPT today, Oct. 5!